After our exclusive interview with Nader Faghihzadeh, BMW 6 Series Coupe Exterior Designer, our attention turns towards the interior design of new 6er. To find out more about the story behind the design, BMWBLOG sat down with Christian Bauer, a young talented BMW designer who had the honor to design the interior of BMW’s super sporty coupe and cabriolet. Bauer belongs to a new generation of BMW designers that find attraction in technology as well, and the new 6er design comes to emphasize his aspirations and ideas in combining design with high-tech. BMWBLOG: We feel that the new 6 Series Coupe received some design influences from the CS Concept. Did the concept serve as an inspiration for the design of the new 6 Series? Christian Bauer: Yes, exterior-wise, it’s the same language, same influence, of course. And from the inside as well, it’s the same general ideals, to show a driver-oriented car, very luxurious, kind of wellness included. So, it’s the same thing, only longer and bigger. BMWBLOG: Compared to the previous generation 6 Series, are there any new materials used for this one, to make it more distinct? Christian Bauer: In this case, we had the first opportunity to show the Bang & Olufsen system, so we have different speakers which are more high class than ever before, and that gets a totally different feeling to the interior. We also have the black panel technology that we use in the 7 Series. 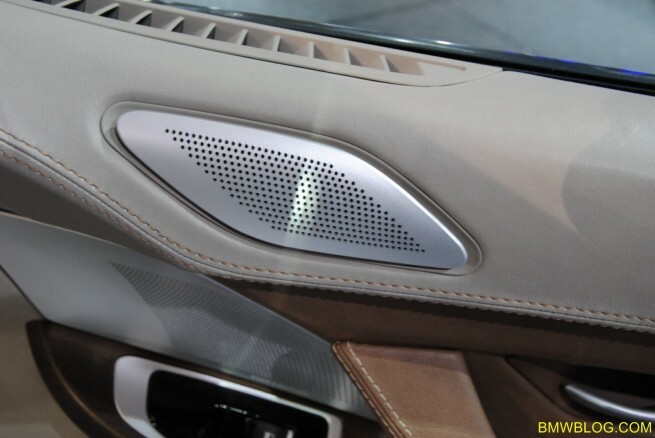 BMWBLOG: Were the speakers designed by Bang & Olufsen designers? Or was it a BMW design? Christian Bauer: It was a cooperation. We put together things that we could both work on and discussed how it would fit to the design language of the 6 Series, because the 6 Series has very much sculptured surfaces, and B&O’s in general have pretty clean, calm surfaces. But as you can see, it works pretty well together. 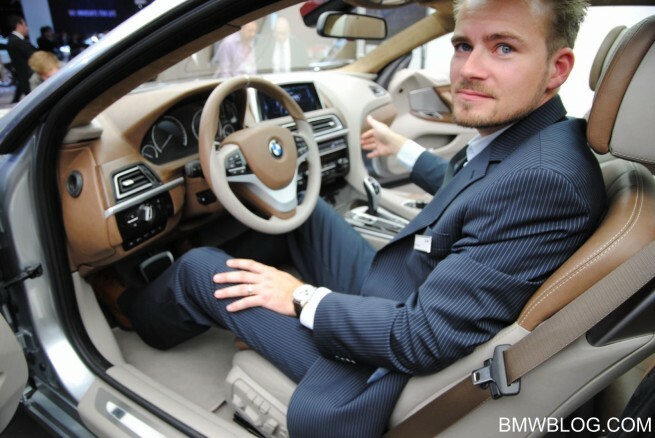 BMWBLOG: You mentioned the driver-oriented dashboard. 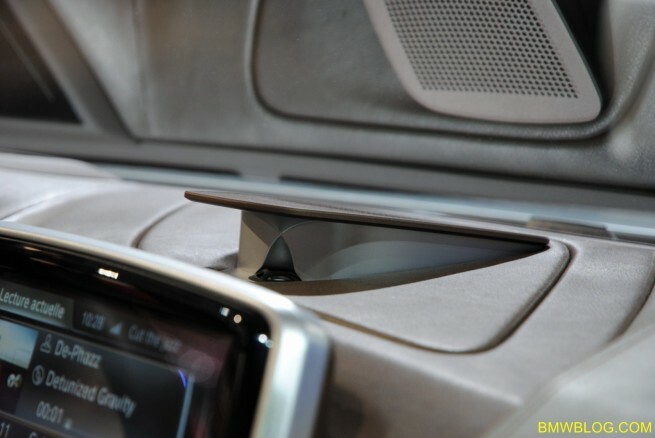 Do you think this is something that will continue to appear in BMW design? Christian Bauer: I think it has become more and more important to show that in general that was our main focus – and in this case, it’s definitely special. In the 6 Series, we have the most driver-orientated cars, so all the others won’t go probably in that direction, all future cars. But for the 6-series, which is our most luxurious and driver-orientated I think that was the best direction, to show more driver-orientation, to emphasize that “this is my working space” and the comfort space on the other side. This was the general idea. 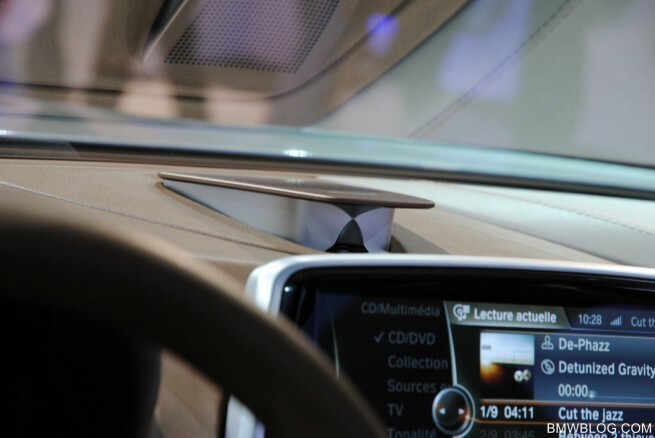 BMWBLOG: With technology bombarding drivers these days – what kind of design hurdles does this design present? Are there any difficulties in trying to match too much technology with the new design? Christian Bauer: If you have special components that we have to take over from the series production or from different cars, 7 Series for example, of course there are some difficulties, especially the general idea to bring the dashboard as low as possible so that you have a feeling that the exterior is flowing into the interior softly. This was important for the 6 Series family. The new LCD had to really stick out, so we had to push the interior panel as lower as possible. Therefore we had some difficulties to integrate the screen which was not supposed to be standing free. 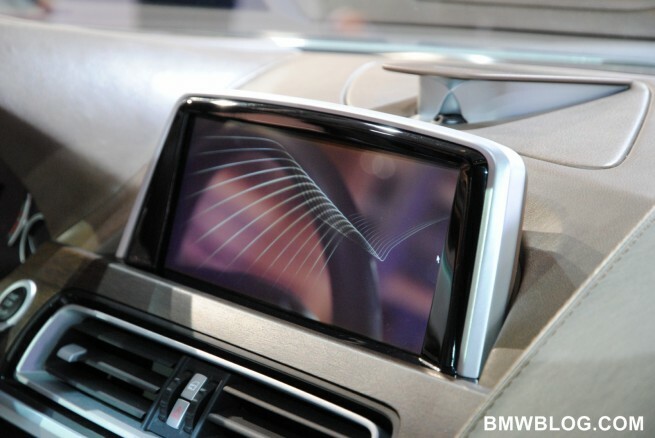 BMWBLOG: Why not a retractable LCD screen? Christian Bauer: We think that you don’t really need the retractable screen, you need it all the time to see the display. And the second thing is that it’s easier to integrate the technical features. We’re standing for technology, including the emotional design, so why not show this thing all the time? 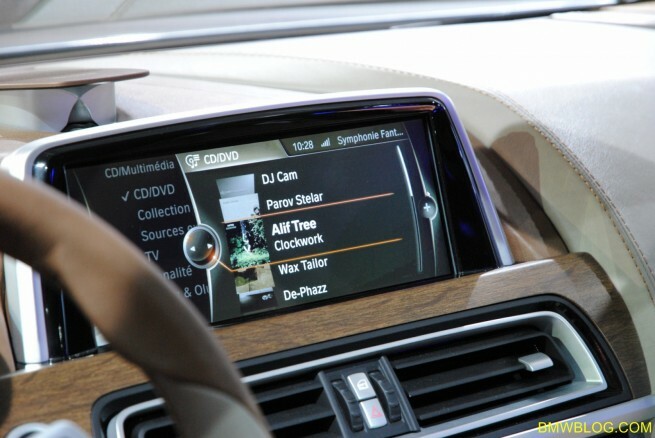 BMWBLOG: As a driver’s car, BMWs are well connected to the road. How will the new 6 Series improve that driving experience from within the cabin? Christian Bauer: It was very important to me to show dynamic into the interior with special lines. The door is designed to go on top of the interior panel, and not too close in front of the itl, like in the old 6 Series. I wanted to emphasize the speed that is going towards the street. You feel that you’re connected with the outside and you don’t stop at anything, there is no line in front of you. Also the line coming from the center stack, it doesn’t just come around, it doesn’t close in front of the driver, it actually shows the direction you want to drive towards to. This offers more dynamics to the eye and I think it works pretty well. 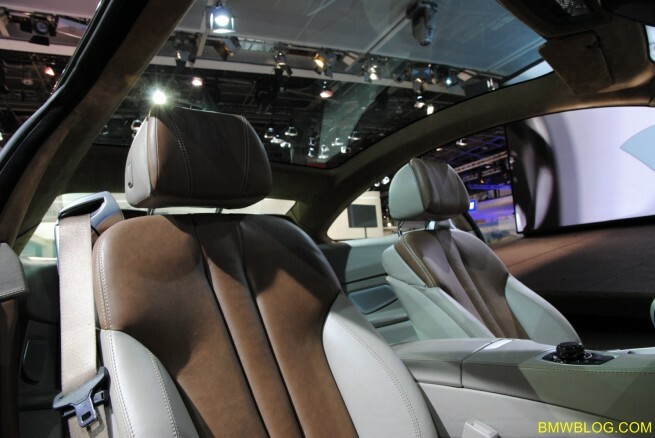 BMWBLOG: What is your single favorite design element in the interior? Christian Bauer: Actually I think the coolest thing is the monitor. I like technology, and the iPhone, so I’m really happy with that. Also it helps the interior to look slim and low. I think the whole industry wants to slim the monitor, the technology in general. You have more space to design everything around it. If you have big blocks, you have to cover something and then it’s getting bigger and bigger, and you don’t have freedom to design anymore. BMWBLOG: This car was designed with a layering technique. And that started back with the Vision Concept, last year. Can you just explain the whole layering design concept? Christian Bauer: Yes, sure. Actually it has more than one idea behind that. Layering can show that you have something which is floating on top of something else, makes it lighter, and on the other hand it shows that it’s more tri-dimensional. Right now, everyone is closing the surfaces to another surface, and then you see a volume, a complete volume. That doesn’t show dynamics, it shows something that’s closing. Layering opens up the space, you can play more with light and shadows, especially around the door. It makes the whole car look a little bit more dynamic. Christian Bauer: Exactly. And actually, we wanted to connect those, so called, shut-lines; to bring elements out of shut-lines and especially lights, for example. For the Bang & Olufsen parts, we added some light behind that, illuminated the surrounding and that thing pops out and really sticks to the eye, and makes it more elegant. 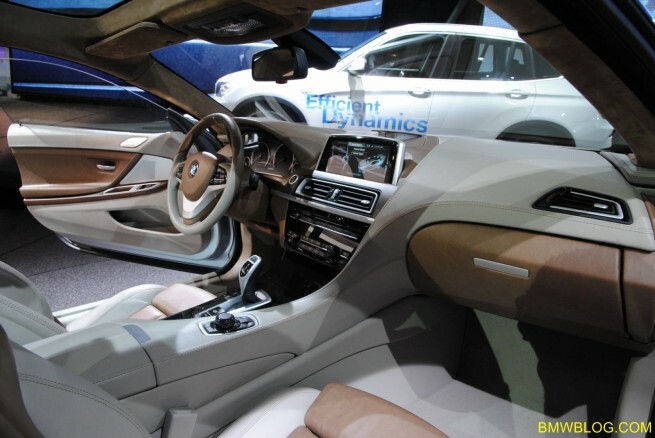 BMWBLOG: Beside the driver-oriented dashboard, what do you think are the interior design hallmarks for BMW? Christian Bauer: One thing that is shown in the 6 Series, but not as important as in the other cars, is the horizontality which brings a little bit of calmness to the interior. We don’t have everything going one way, but rather you have something the eyes can relax on. That’s always a typical BMW feature – something for the eye to rest, “my horizontal bar who keeps me safe”. I think that’s very important. I think what is also very BMW is that you don’t have surfaces that are only twisted in one part, we always try to give more life to the surfaces. It gives more room and more light to the surface. It’s supposed to be sculptural. I think that’s very BMW. BMWBLOG: Does this particular car bring any new design hallmarks for BMW? Is there anything new that hasn’t been done before? Christian Bauer: I think it’s mainly taking many design ideas and putting them together and interpreting to another style. What we didn’t have before probably was the wooden part on the door, that’s coming up to the rear, so that’s a very unique design element. It also gives speed, and the wave coming from the dashboard down goes up and goes back to the exterior. So you combine the exterior and the interior, somehow with the lines, and this was not so much dealt with in the past. I think that’s more of the language we want to go to, we want to connect everything and make it speak in one language, and not too different. Interior was always something that was standing for itself, same as the exterior. In this car, I worked very closely with my colleague Nader, the exterior designer, and we shared the same shape ideals. Nader’s design also comes from water gestures. His idea was to go with something that was in the water, the lines shaping the form. This kind of ideals, wellness and water, are slowly going into the interior and going out to the exterior again. 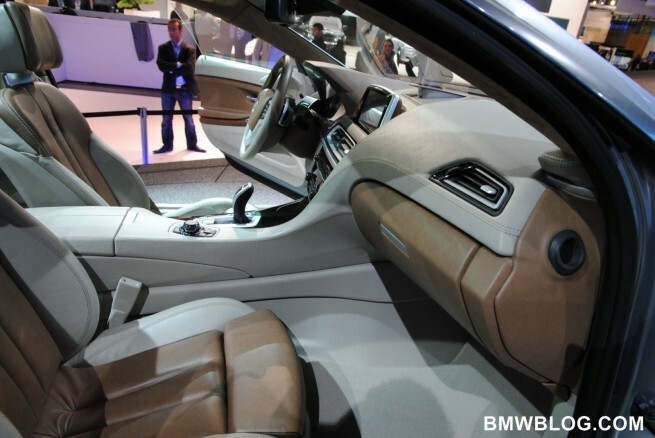 BMWBLOG: When you design an interior, when you present the study/your sketches, do you find inspiration in other cars? Not necessarily competitors, but other cars in general. Christian Bauer: I always look at other cars and look at what the others do, but in general the main idea of the process is to find a new language, to give something new to BMW, that the others don’t have, and to stick to our own language. 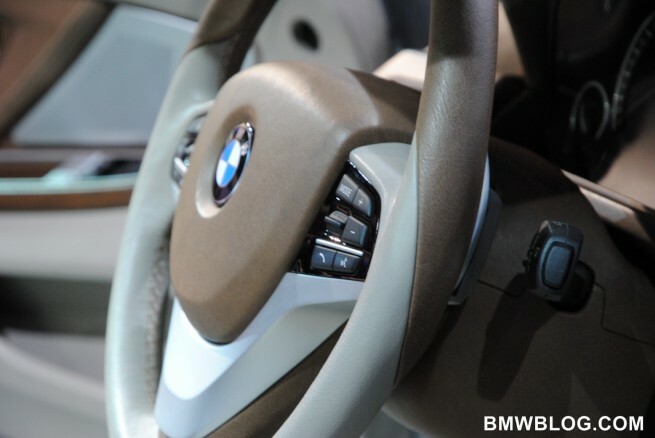 BMWBLOG: Can you tell us more about the two-tone interior and the sculpted console? Is this something that we’re going to see in the production car? Christian Bauer: It will be closer. Of course the car shows here is a concept and we want to show a little bit more extreme orientation. But in general, with the color you can show some orientation and all the other sides give more calmness to the passengers. That was very helpful actually. BMWBLOG: What other areas outside the automotive industry drives your design? Christian Bauer: Actually I’m pretty much into technology. I like Apple, and I’m a big Apple fan and technology fan in general. So for me the integration of software and hardware into a car is very cool. 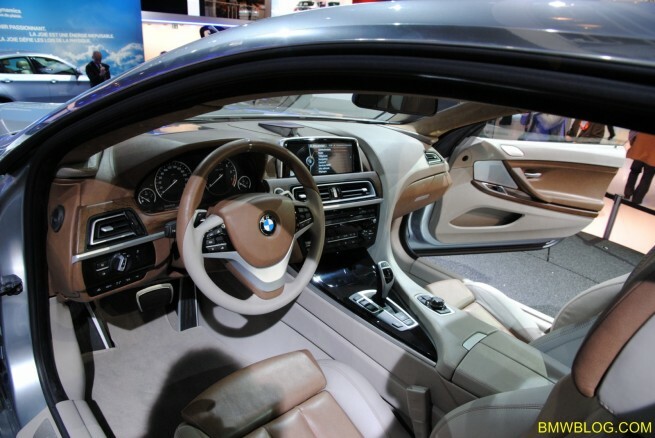 BMWBLOG: Looking back through time, which BMW interior design you like the most? Christian Bauer: It’s hard to say. I like many cars interior. I really like the Mille Miglia interior which is so radically easy. BMWBLOG: What car do you currently drive? BMWBLOG: To summarize our conversation, can you please give us a short overview of new 6 Series design? Christian Bauer: So the main important lines are the dashboard which is showing an orientation for the driver and for the co-driver, they should feel comfortable and safe. Also, the twisting of surfaces following down on the surface of the dashboard line, then the door line which is going on top of the interior panel, like a cocooning factor for the driver, and extends towards the front. And third line – the horizontal orientation – only in the co-driver part, with a slightly different material which gives an impression that it’s a little bit softer around you. Christian, thank you for your time!